Based on interviews with leading sports journalists and grounded in the authors’ experience and expertise in the sports journalism industry and sports media research, Sports Journalism gives in-depth insight into the editorial and ethical challenges facing sports journalists in a fast-changing media environment. The book considers how sport journalism’s past has shaped its present and explores the future trends and trajectories that the industry could take. The far-reaching consequences of the digital revolution and social media on sports journalists’ work are analysed, with prominent sports writers, broadcasters and academics giving their insights. 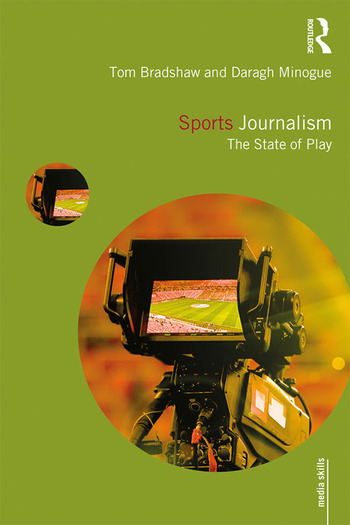 While predominantly focused on the UK sports media industry, the book also provides a global perspective, and includes case studies, research and interviews from around the world. Issues of diversity – or a lack of it – in the industry are put into sharp focus. Sports Journalism gives both practising sports journalists and aspiring sports journalists vital contextualising information to make them more thoughtful and reflective practitioners. Tom Bradshaw is Senior Lecturer and Course Leader in Sports Journalism at the University of Gloucestershire, and an award-winning sports journalist. His main research area is media ethics. Alongside his teaching and research, Tom writes for The Times and other titles, and broadcasts for the BBC. Daragh Minogue is Principal Lecturer and Course Leader in Sport Journalism at St Mary’s University. His current research focuses on identity, politics and the sports media. He contributes to the journalism training programme at Sky Sports News and has received commendations for promoting equality, diversity and inclusion in journalism.